The winderchildren by Hubrig are world famous. These smokers all show typical scenes of life in winter with all ist magical sides. 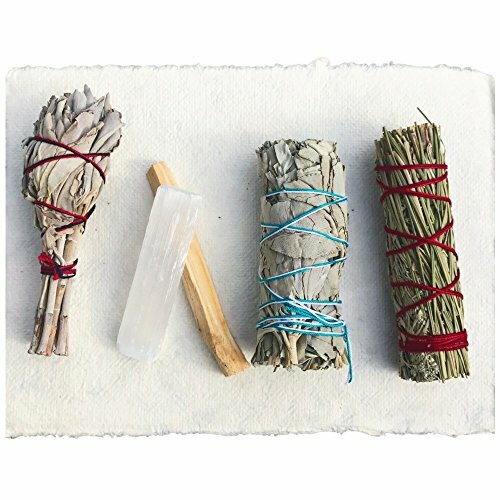 They are used with regular smoking cones, which are available in many different scents. 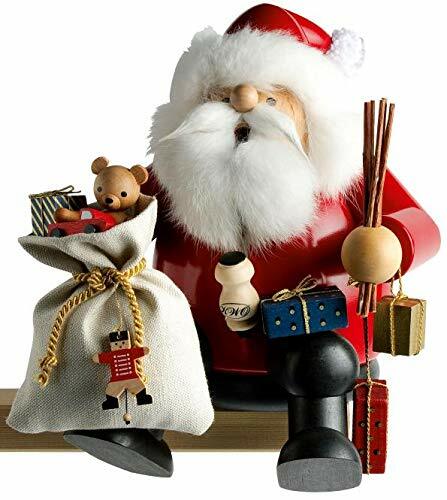 This Christian Ulbricht incense smoker is one of the new additions in 2014. 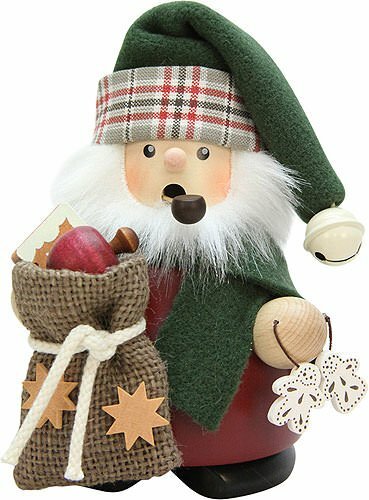 His products are authentic goods from the German Erzgebirge region with an 80-year long tradition. The family owned workshop Drechselwerkstatt Uhlig still makes their incense smokermen (in German = Rauchermann) with traditional techniques that have been used for centuries. 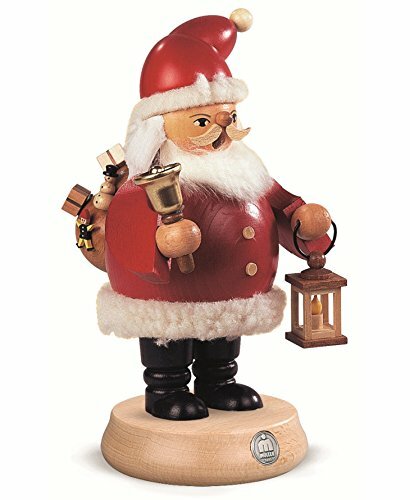 With an Uhlig smokerman you get a piece of traditonal German handcraft from the famous Erzgebirge. This smoker was handcrafted and produced by the Erzgebirge wood artists in Germany. . This detailed piece features the sitting Santa Claus. . This high quality smoking man is about 6 inches tall. also available in 37 cm / 14 inch (prod.-no. 01-21-260)The German Smokers by KWO (Kunstgewerbe Werkstätten Olbernhau) are famous all over the world. KWO Smokers have many collectors and enthusiasts. This smoker was handcrafted and produced by the Erzgebirge wood artists in Germany.. 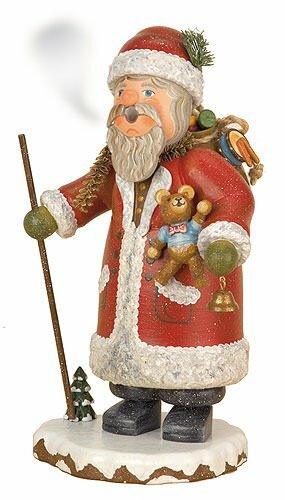 This piece features Santa on a sled. . He is carrying gifts and a Christmas tree. . This high quality smoking man is about 6.25 inches tall.. This smoker was handcrafted and produced by the Erzgebirge wood artists in Germany.. 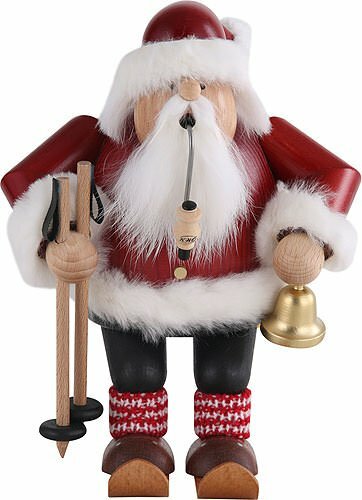 This piece features a Skiing Santa Claus.. This high quality incense smoker is approximately 7.9 inches tall. Christian Ulbricht Smoker - Handcrafted German smoker with carved details. 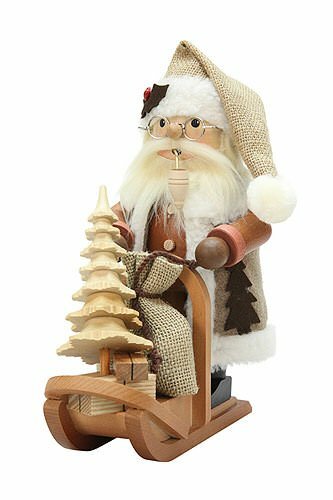 Santa on sleigh with carved tree and gifts. Made in Erzgebirge, Germany. Lovely smoker by Christian Ulbricht. It was released in 2015. This wooden smoker was handcrafted and produced by the KWO wood artists in the Erzgebirge region of Germany. 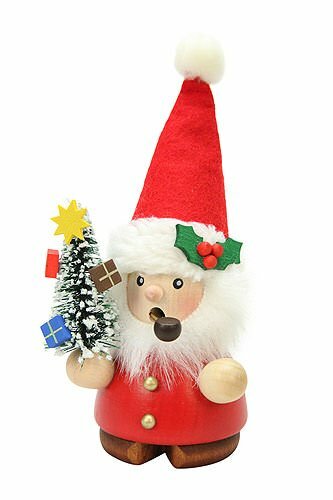 This piece features the sitting Santa Claus. 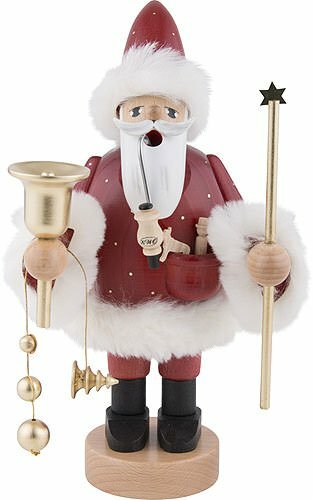 This high quality incense smoker is approximately 10.2 inches tall (26cm). Note: Bench board is not included with smoker . 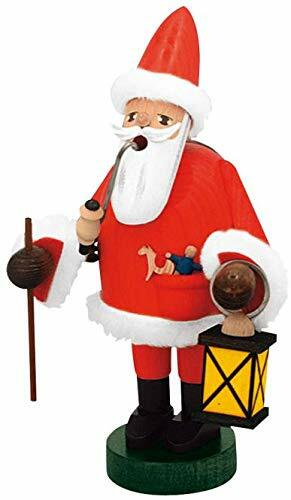 Santa with Sleigh Toys German Smoker is great to have in your holiday home. With his bright red coat and teddy bear and toys on his pack and sleigh nearby he is ready to bring cheer to your family. 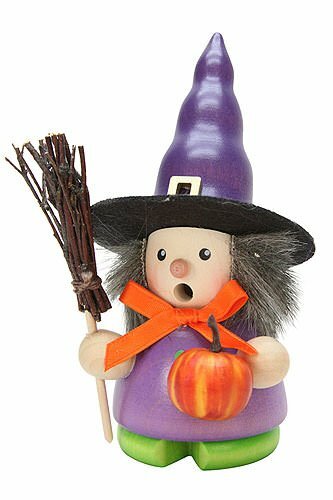 Stands about 7 1/2 inches tall and was handcrafted in the Richard Glaesser woodshops in the Erzgebirge Mountain village of Seiffen Germany. 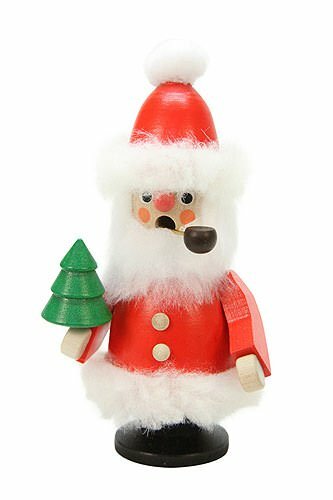 Be the life of the party, bring a German Smoker along and impress your friends and family members with this unique handmade figurine that smokes incense. 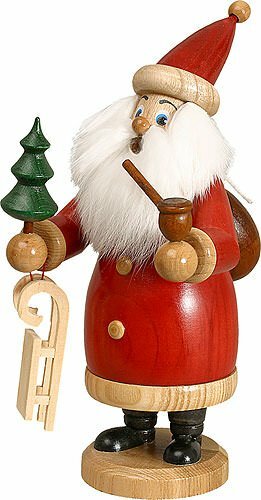 This is smoker was handcrafted and produced by the Erzgebirge wood artists in Germany. . 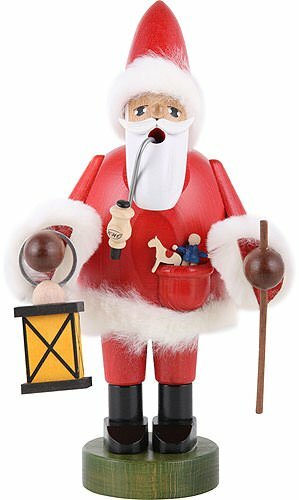 This piece features Santa. He has a lantern in one hand and a walking stick in his other hand. . This high quality smoking man is about 7.9 inches tall.. 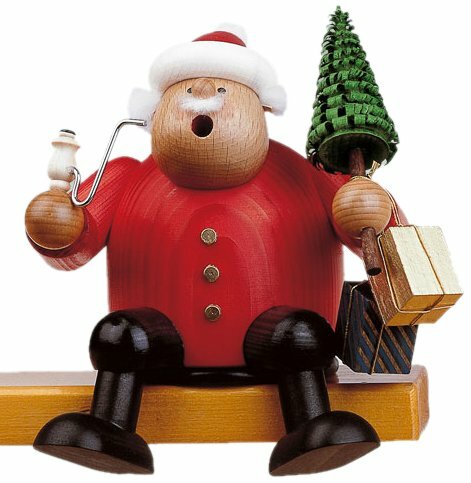 This smoker was handcrafted and produced by the Erzgebirge wood artists in Germany. 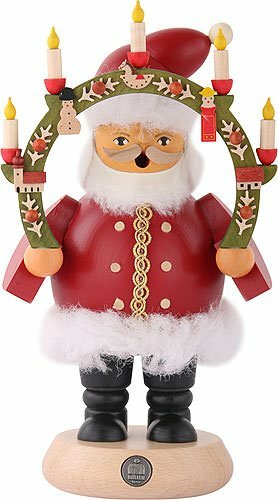 This beautiful piece features Santa Claus dressed in red. He is holding a bell and has toys in his pocket. . About 7.9 inches tall. 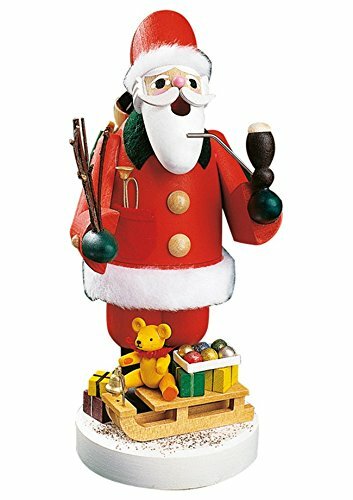 with a large pipe, presents and bellsThe smokermen by KWO (Kunstgewerbe Werkstätten Olbernhau) are famous all over the world. KWO Smokers have many collectors and enthusiasts. This is a 2012 incense smokermen design by Christian Ulbricht. Christian Ulbricht is one of the most famous workshops in the German Erzgebirge. Besides several hundred motives of incense smokermen Christian Ulbricht is famous for nutcrackers. Many collectors are waiting for the new models to come out every year. 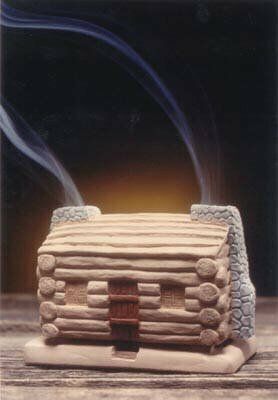 Christian Ulbricht incense smokermen are a wonderful present for your friends, family and yourself. Once you have the smokerman in your hands you will right away realize the great value of this handcrafted piece.